This guide will assist you with the general steps needed to configure Nokia's Symbian based devices, however it may also be used for other devices such as Maemo based phones. Please note that we do not guarantee full functionality for the SIP applications in these phones. This guide is only provided for those who wish to experiment, and potentially use, these devices. Ideally you will want to use a wifi connection with these features. You may also use this guide to assist you with configuration of similar Nokia products. DISCLAIMER: We HIGHLY recommend using your Nokia device over a wifi connection instead of a GSM/Edge or 3G network as these types of networks have high latency and will not provide an optimal experience. We do NOT guarantee that the Callcentric services will work over any of the major cellphone internet access technologies (GSM/Edge, 3G...etc) due to the latency issues involved with these types of networks. DISCLAIMER: Some of Nokia's recent devices do not have the Internet tel. app installed. As such you may be able to perform initial configuration but may not be able to actually place or receive calls. On our end there is nothing we can do for this and the only options available would be to find the Internet tel. app or wait for a firmware upgrade which would, hopefully add this application. Currently we are aware of the N96 and N78 which fall under this category. In this guide we will walk through configuring the SIP/Internet tel. 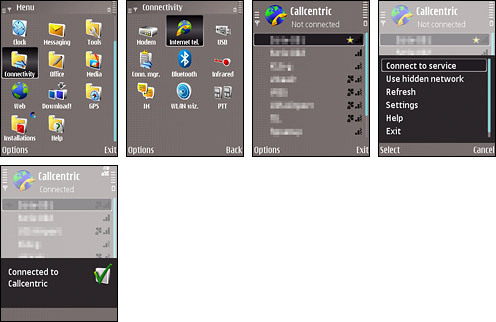 application on a Nokia E90 device running Symbian OS 3rd revision in order to register it to the Callcentric servers so that you will be able to place and receive calls using your Callcentric account. This guide relies on the built in Internet calling application available in most newer Nokia devices. For more advanced configurations you may follow this guide however the instructions may not be as accurate. Before moving forward please ensure you are able to connect to your desired network. The phone should be turned on and running and you should have access to the device's configuration menus. We will now navigate to the SIP configuration application in your device. Public username: This is either the default extension 1777MYCCID OR 1777MYCCIDEXT, where 1777MYCCID is the 1777 number assigned to you by Callcentric and EXT is the three digit extension you are trying to register this UA to. Once the above settings have been configured please move on to the next step. Once done move onto the next step which is configuring your Registrar server. This is one of the most flexible, and probably confusing, part of configuring your Nokia device. When it comes to using the account you just created you have various options. You may set the account to always connect (Option A) to your Callcentric account or you may connect only when necessary (Option B). We highly recommend setting your phone to connect only when needed as registration may be unstable if configured for always connecting and may drain battery life. *Please note that if you wish to use your GSM/Edge or 3G connection you will need to use Option A and set your Default access point to your cellphones data connection. Keep in mind our disclaimer regarding GSM/Edge or 3G connections not being stable due to latency issues. Option A - To connect automatically you will simply need to change the setting Registration, found in the Basic settings part of your SIP configuration, to Always. Note that you will also have to set your Default access point, preferably to a wireless connection. You should be presented with a confirmation dialog stating that you successfully connected to Callcentric. 8 That's it! You can now make a phone call.